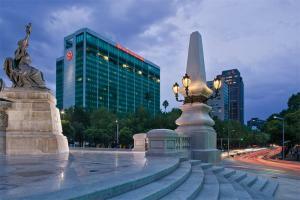 Discover Mexico City at the Sheraton Maria Isabel Hotel & Towers. Centrally located on Paseo de la Reforma, overlooking the famous Angel of Independence and just two blocks from the Casa de Bolsa stock exchange building. Sink into the new Sheraton Sweet Sleeper™ Bed in all 755 spacious guest rooms. Whether you want a peaceful night's sleep for a meeting or a relaxing vacation, you'll love the custom-designed plush mattress, cozy comforter, and five cushy pillows. Located only 30 minutes from Mexico City International Airport.